Venezuela's Supreme Court has delivered a blow to an opposition campaign to oust President Nicolas Maduro. His opponents want to end his term in office early via a recall referendum. The court ruled on Monday that they must now secure signatures from 20% of voters in each of the 24 states, rather than 20% of the overall electorate. Venezuela is facing severe economic problems and although Mr Maduro's popularity has plunged, he has control over key bodies such as the court. The key dates for the opposition campaign are 26 to 28 October. On those days it must collect and electronically verify enough signatures to trigger the recall referendum. It had faced a tough task already trying to reach a sum of around four million voters. Now it must meet a 20% threshold in each state, including rural areas where support for the left-wing government is stronger. The court said on Monday: "The failure to collect that percentage in any of the states or the capital district would nullify the validity of a presidential recall referendum." Another key date is 10 January. If the recall referendum happens after then and Mr Maduro loses the vote, which opinion polls suggest would be the case, he would be replaced by his handpicked vice-president. Mr Maduro has used institutions like courts to try to neutralise the control the opposition has over the National Assembly. 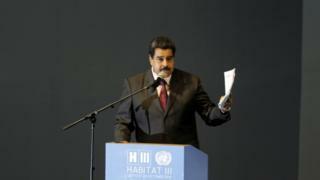 Mr Maduro was elected in April 2013. His term runs until 2019. The oil-dependent country has seen three years of deep recession, with inflation expected to top 700% this year. There are huge shortages of food and medicines, and looting is widespread.